A Cedar Waxwing perches on a branch at Canaan Valley Refuge. 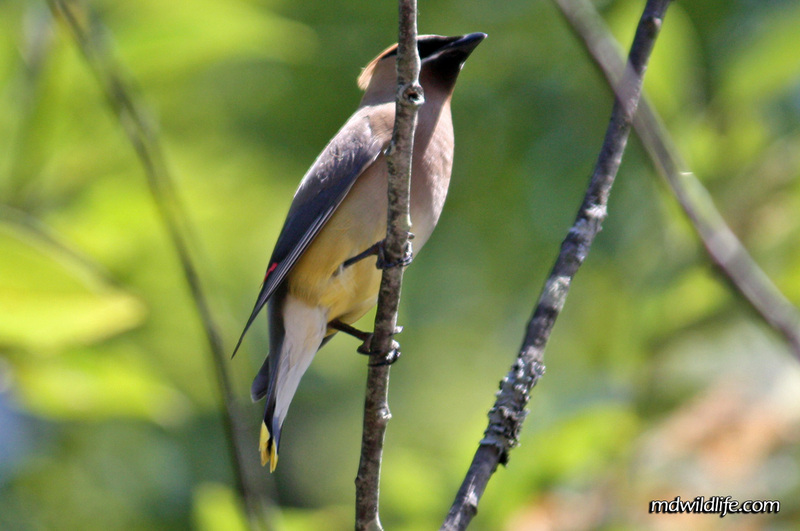 The Cedar Waxwing (Bombycilla cedrorum) is a small to medium sized songbird that can be found year round in all areas of the state of Maryland. The Cedar Waxwing east various berries or small insects and is usually perched in high trees; definitely not a walk along teh ground species. It is somewhat easily identified by color pattern and shape. Both males and females have the same grayish color on their back. The “waxwing” name comes from the red tips on its wings and the yellow of its tail, giving the bird the appearance that it was dipped in wax. The Cedar Waxing also has a crest. The photo above was taken at Canaan Valley National Wildlife Refuge in West Virginia, but I have seen the bird at Eastern Neck Island and Blackwater National Wildlife Refuge as well.